Install your thermostat in a high-traffic area to make the best use of its sensors. When temps drop below zero, wouldn't you prefer to snuggle in bed and forget about the thermostat? Wouldn't you love to burrow beneath your plush comforter and adjust the room's ambient temperature from under the covers? A smart thermostat can provide these conveniences, and if you get one, you may also notice a savings on your electric bill. Not all smart thermostats have the same features. To stay warm and cozy in the winter and breezy in the summer, it helps to know which smart thermostat functions would make your life a little easier. Do you wonder what the difference is between a programmable thermostat and a smart thermostat? Smart thermostats are capable of scheduling, and some models adjust themselves according to ambient and outdoor temperatures. Some smart thermostats can even "learn" from your behavior; programmable thermostats aren't able to do this. Many smart thermostats have a bevy of sensors that include the ability to record humidity levels and keep track of when you're home or out. Units of this type also feature wireless capabilities that let you check your home's temperature from afar. Most smart thermostats allow you to set your home's heating or cooling remotely -- so, for example, you can check to make sure your pets are comfortable while you're at work. Many companies also provide helpful information and encouraging stats by email that help you increase your energy savings. What type of heating or cooling system do you have? The smart thermostat you choose must be compatible with your current heating and/or cooling equipment. Installation is relatively simple in most cases, but if your wiring is old and lacks a C-wire (common wire), you'll need the help of an electrician to get the thermostat installed correctly. Do you already have a "smart" home? If you already have smart home devices that you use on a regular basis, consider adding a smart thermostat that's compatible with your Google Home or Alexa. Many smart thermostats can be controlled via a smartphone app. Do you turn down the thermostat during the night to save energy? With a smart thermostat, you can wake up the next morning and adjust the temperature from the cozy confines of your bed; just grab your phone. You don't need to be home to make adjustments, either. Let's say you're at the beach enjoying a hot day in the sun. A quick tap on an app allows you to set your home to cool so it's comfortable when you get home. 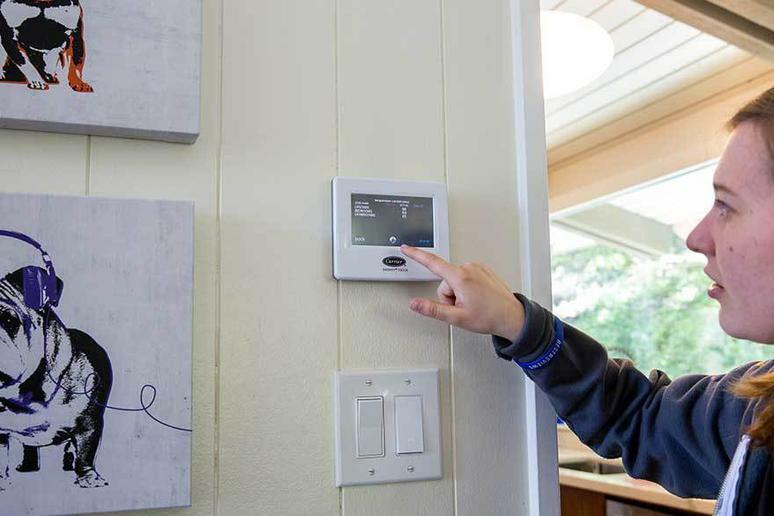 A programmable thermostat can be set to heat or cool depending on your schedule, but a smart unit can learn your habits and adjust according to a variety of factors. Some units can even sense when you leave the house and change the temperature accordingly to help you save money. Some thermostats can be used in conjunction with other smart home technology. Ask Google Home to stop cooling the hallway, or tell Alexa to start heating as soon as you step through the door. Does your thermostat detect when no one is home? Use it, along with a compatible smart light bulb system, to control the lighting and prevent burglary. The right smart thermostat can help you save money on your monthly energy bills, but there's still an upfront cost to consider. Savings can be significant if you take full advantage of all your new thermostat has to offer, but many intelligent devices cost at least $120 to purchase. Some homes may also require multiple units, and there's the cost of installation to consider, as well. Q. Will it take very long to recoup the cost of a smart thermostat? A. It may take a little while to see a return on your investment, especially if you've purchased more than one unit for your home. But if you're replacing a single thermostat, you'll likely see savings within a year. It'll take time to adjust the thermostat to your liking and learn how to take advantage of all its features. Q. I have pets and don't want them to freeze or overheat while I'm not home. How can I make sure my thermostat doesn't switch to energy-saving mode while I'm away? A. Some smart thermostats have sensors that detect whether you're home or not. Depending on the size of your pet and placement of your unit, your thermostat may or may not recognize your pet as someone who is home. Not to worry. Many units allow you to set a baseline temperature, so even if your device goes into energy-saving mode, it will not drop below or go above a specific temperature. This function is also a handy failsafe to prevent pipes from freezing in the winter. Our take: The ultimate learning thermostat for the homeowner seeking the best in home automation. What we like: Installation is simple. The Nest learns your habits and has smart sensors that automatically adjust your home's temperature to maximize energy savings. What we dislike: It's one of the priciest units in this category, and it isn't compatible with every home's heating or cooling system. Our take: A smart thermostat that's compatible with a variety of systems and equipment. For the homeowner on a budget. What we like: No tricky installation is required, and the system can be controlled remotely. What we dislike: WiFi connection isn't always reliable. Our take: Customizable temperature control for those who want help reducing their monthly energy bill. What we like: Built-in Alexa control allows for hands-free temperature adjustments. Remote access is also possible, and installation is a breeze. What we dislike: The cost.